1912 we arrived to the Born área with the purpose of moving to Argentina. The first ones, Joan and Josefa came from Nucía, Alicante. They had a lot of courage and a dream of progressing, and so they left the mountains and settled down at the sea. The neighbours and more followed them, because they wanted to build up a future and America was back then the promised land. While waiting the tigernuts that we brought turned into horchata (tigernut milk) and Joan, the first of five generation sold them on the streets, with a table and a jar: “Xe, prova” (“Hey you, try this”) he said. He was so nice that his phrase was engraved in memory. We started at the Paseo Nacional, today the Joan de Borbó. We still wore the blouse and the black hat of the people of Valencia and the women were wearing long skirts till their ankles with the belt on their waist. 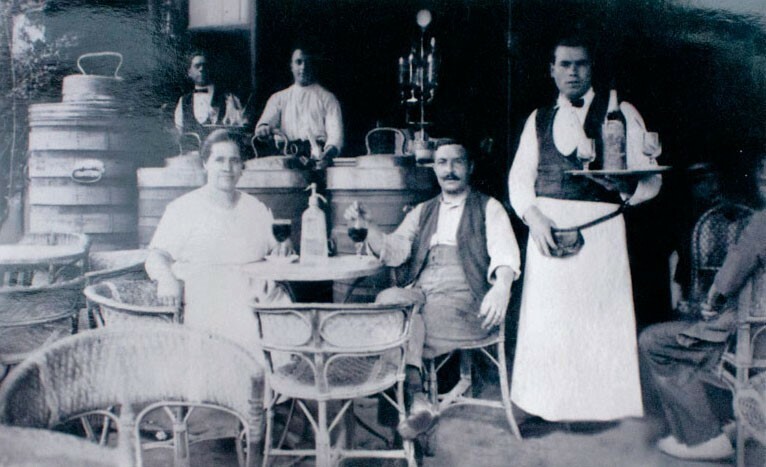 The horchatería was the first one at the neighborhood. At night Rafala, a clown clad in shrill red on an improvised stage entertained the children. The horchata and the merengadas (a cold cinnamon – and lemon – flavored meringue) were unique, handmade, well mixed and shaken. Their attendance for the ship was taking more time than expected and in the meantime Pere Joan, the son of Joan and Josefa grew and in one of the trips to Nucía fell in love with Jerónima. They married, came together to Barcelona and started a business. 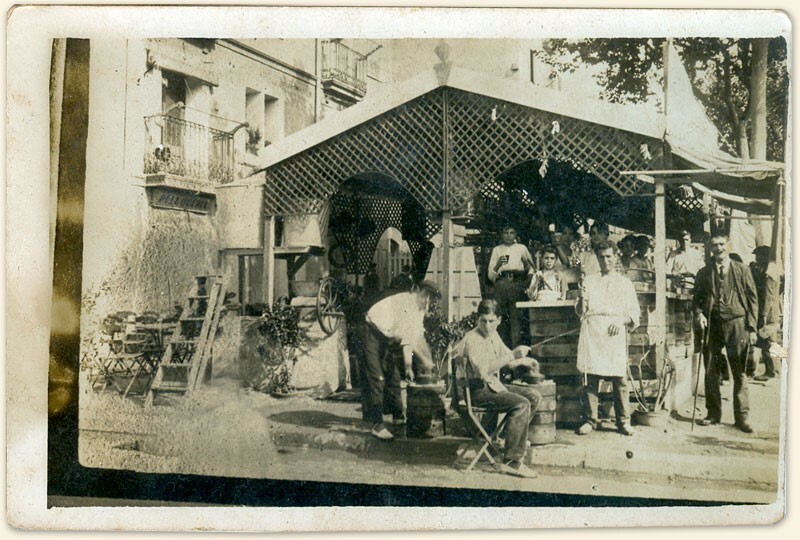 And that was how El Tio Ché was started, which we now continue at the sweetest corner of Poble Nou, a century later, creating and enjoying the taste of well-made products. Even though today, to maintain the quality and the taste we need technology, training, inversion and a lot of endurance to do it well at all times. One day the ship arrived and a part of the family travelled: Pere Joan, one brother and the parents stayed while the rest continued with their journey. Well established at the street Picasso of El Borne and later on at the Barceloneta, the ice-cream parlor Tio Ché could not be stopped. People still remember that in the twenties we owned several restaurants, a café where shows took place and a stage. The real miracle happened however at the corner of Poblenou, where our ice-cream parlor has been since then. Jerónima worked cleaning the horchatas or tigernuts, grinding, mixing, shaking, filtering, cooling them and producing the ice- cream with her strong arms and hands. At the same time she took care of her four children: Pepita, the oldest girl, Juanito, Antonio, Alfonso and María. 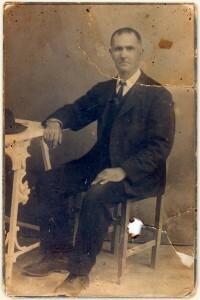 Pere Joan developed the family business further. Jerónima was impressive, she sat on a small counter to the Street and sold tigernuts, peanuts, chick peas and hot walnuts that the children bought with small coins. One day Jerónima handed the keys of the horchatería to her son Alfonso and told him without hesitating: -Tomorrow you start working. When he went out he could be found at the fifth row of the Palacio del Cinema theatre at Via Laietana, alone, where he would enjoy the spectacle. Like all the Iborra he fell in love at La Nucía. 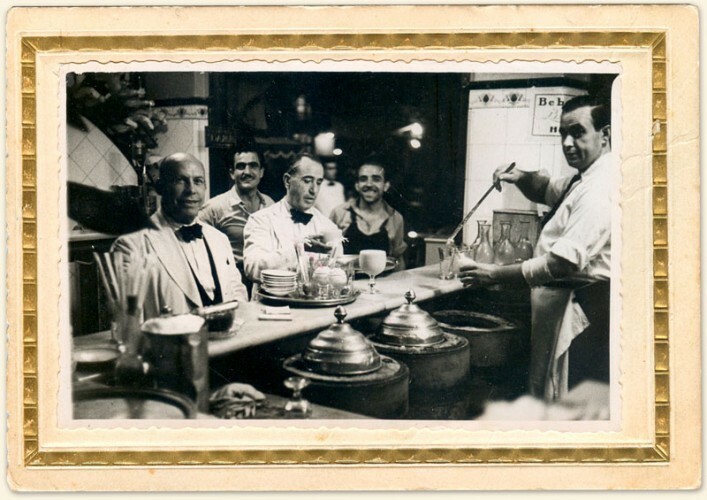 He married Maruja Cano, with whom he had several businesses at the street Lope de Vega of the Poble Nou, but finally the horchatería won them over. 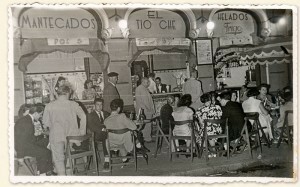 The corner of El Tío Ché was like these days a very lively area of the neighborhood. The children were happy even though they worked together with their parents from an early age on. The neighborhood was always the same, nothing changed and all the traditional shops stayed the same. If the street was for the children, the square was their favorite spot. The benches were the goals fr the soccer games and the stage of all adventures. Not everything was fine. When there was the war the first bombings went down at el Poblenou from the sea. The airplanes came afterwards and at the worst times two or three airplanes flew over the area up to four times a night. At the Street Wad Ras, in front of the Alianza Vieja, a bomb destroyed two blocks. El Tío Che was located on one of the ground floors that were destroyed. The family was eating when the bomb came down; they lost their parlor and their house. Life in a working class neighborhood meant working like hell. The women went to the factories and in the thirties it was quite common to see them leave running so that they could work at home, their second workplace. In this neighborhood there was not even one neighbor who did not work in one of the workshops or in one of the big companies of this Catalan Manchester. The Horchatería was more or less the same. A mixture of family life and work. The grandmother worked for 20, she inserted another bucket with ice within the other one, she moved the cream for the ice cream, or the granizado (iced lemonade) or horchata, and she was working on it day and night, because the mixture is what cools the cream and gives it its consistency. 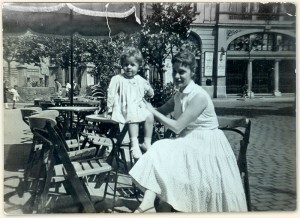 María Iborra, the fourth generation, remembers that her first gift was an apron. Even though the fourth generation Teresa, Alfonso, and the fifth, Irene and Natalia found a well-established business nobody can deny that they have the responsibility to keep up the product in this neighborhood, take care of it every day, as it is enjoyed by each and every one of the neighbors. Teresa, the current owner, explains: We maintain a company that cost them their lives and we want to grow it. We cannot give in. Now it is easier to produce and cool, but the challenge lies in keeping up the same quality and the same service. We are all very attentive to our customers. We keep the recipes that the owners passed on to us. Certainly the ones that come after us will do the same. This is the effort of a family that is constantly fighting to keep up the business. We do it with a lot of passion, everything is about craftsmanship: the product and the service we provide for our customers. We sell whims, even though these are natural and healthy products, they are whims, which is why we try to make people enjoy them before, during and after their visit to the parlor. We take care of people in the same way in which we do of the horchata, which is very delicate. The customers are aware if you have overdone it with sugar or wáter, they have been coming for years and are our usual customers, which is why we cannot offer them something else to that which they remember eating. You have an enormous responsibility about the product. I have modified the recipes of the ice cream, the base recipe is the same, but when I use new technology there are changes. And every change will be commented on by my customers. Once a year we do new products. It is not a big deal to create new tastes, but to have people like what you do. We started with the turrones (Turkish honey) 1997. I took courses on how to produce chocolate and confectionary and I learned to do it. Now December passes on very quickly. The quality and adequate handling of chocolare are crucial, two or three degrees more or less make a severe difference for the product. I learnt the profession from my father. He was everywhere at the same time. He taught me to take care of an inherited product, this is my main function at the parlor, if I do not take care of the product… this is what we all live off, the recipe is easy: do the right thing. 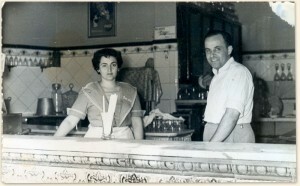 My mother worked on the horchatería while my father went shopping and developed the business. This is a childhood dream… when I started working preparing the sausage sandwiches standing on beer boxes so that I could reach the hotplates.